Aloha! We appreciate your subscriber interest and the opportunity to expand our reach. 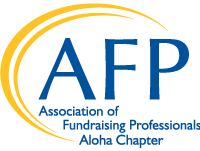 The Aloha Chapter shares notifications, invitations, and announcements aiming to make the public aware of offerings and services to advance philanthropy by enabling people and organizations in Hawaii to practice ethical and effective fundraising! If you would like to subscribe to the AFP Aloha Chapter's monthly E-newsletter "The Mentor," please email admin@afphawaii.org and include in the subject line: Email Subscription Request. Unsubscribe options are on each notice and subscribers can always call the Aloha Chapter office for additional support.